Scott Silverman, Chairman of the Board of VeriChip Corporation, has proposed implanting the company's RFID tracking tags in immigrant and guest workers. He made the statement on national television on May 16th. The VeriChip is a very small Radio Frequency Identification (RFID) tag about the size of a large grain of rice. It can be injected directly into the body; a special coating on the glass case of the chip helps it to bond with living tissue and stay in place. A special RFID reader broadcasts a signal, and the antenna in the VeriChip draws power from the reader and sends its data. 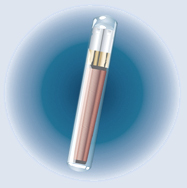 The VeriChip is a passive RFID tag; since it does not require a battery, it has a virtually unlimited life span. RFID tags have long been used to identify animals in a variety of settings; livestock, laboratory animals and pets have been "chipped" for decades. In a related story, Colombian President Alvaro Uribe allegedly remarked that microchips could be used to track seasonal workers to visiting US senators Jeff Sessions (Alabama) and Arlen Specter (Pennsylvania). "President Uribe said he would consider having Colombian workers have microchips implanted in their bodies before they are permitted to enter the US for seasonal work," Specter told Congress on April 25. "...you don't know what's going on in the crazy culture outside. It's a bugged and drugged world. Ninety percent of the bods have bugs implanted in their skulls in hospital when they're born. They're monitored constantly." Update 01-Jun-06: The source for this story was inadvertently omitted; read the press release at spychips.com; also, see the Silverman interview transcript. Update 01-Jan-2007: I've discovered an even closer match in sf; see the entry for the radiant from Jack Vance's 1964 novel The Houses of Iszm. End. VeriChips are legal for implantation in people in the U.S; see VeriChip RFID Tag Patient Implant Badges Now FDA Approved. See also a related story on a Proposed National Worker DNA Fingerprint Database. Read more at RFID implants for guest workers?, Latin leader keen on ID chips and Chip implants for migrant workers?.